** STUNNING EXAMPLE ** FACE LIFT MODEL-RARE CALCITE WHITE-FULL MERCEDES MAIN DEALER SERVICE HISTORY-MAR 2020 MOT-AMG SPORTS PACK-HEATED LEATHER-AIRSCARF- ANTHRACITE 18' AMG ALLOYS-ALL WEATHER ROADSTER-SHARP STYLING & LOOKS-GET READY FOR SUMMER! A sports roadster with sweeping contours, a folding metal roof, clever tech throughout and a refined interior. What's more, this is a practical car that can cope with everyday life and is affordable to run. It's a car that will ensure you stay comfortable on long journeys and is a real pleasure for short bursts down country lanes in the middle of summer. 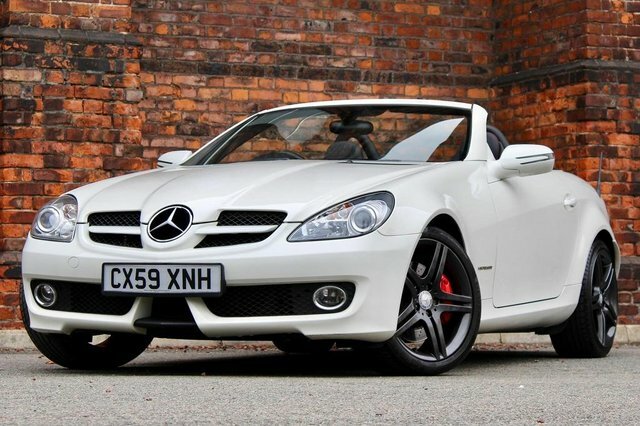 Come and view the latest stock of used Mercedes-Benz SLK models for sale in Warrington here at Select Motor Trading today. A member of our team will ensure you receive a warm welcome and will guide you through the full range of used cars available.